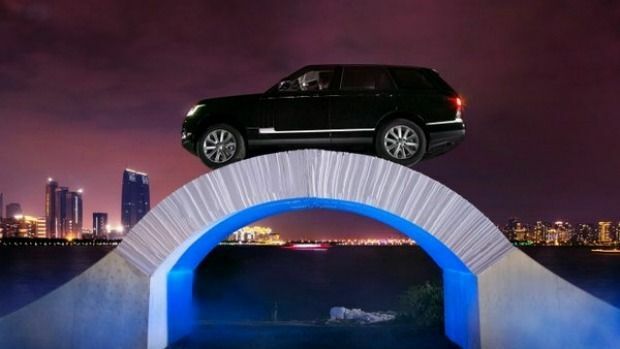 To mark Range Rovers 45 -year anniversary Land Rover drove their flagship Range Rover over a bridge entirely made of paper spanning five metres without glue or bolts to hold it in place, to mark the innovation of the car manufacturer since 1970. Suzhou, famous for being called the 'Venice of the East' is not short of bridges; it is however pretty unique to build a freestanding bridge made out of thousands of sheets of paper. The bridge took three days to build and was constructed using high quality paper supplied by specialist British manufacturer- James Cropper PLC. The Range Rover navigated the paper bridge with its on-board 'all terrain response control', which optimises the control of the vehicle in a variety of environments without interference from the driver. The fourth generation model released back in 2012 was the first 4x4 to be made entirely out of aluminium, and each model ever since just keeps getting lighter. Taking a look back to the past, Range Rover hasn't been short of achievements. When the car debuted in 1970 as the world's first luxury 4x4, it has since been the first ever 4x4 to be fitted with ABS anti-lock brakes and introduced electronic traction control and electronic air suspension to the entire sector.